Abstract: Almost all geochemical reactions occurring in the Earth system start at mineral surfaces or mineral-water interfaces. To reveal the nature of surface reactivity, the surface structure of minerals needs to be investigated, which control their surface reactivity. However, due to the limitation of experimental techniques, most studies on the physical and chemical properties of mineral surfaces were mainly carried out by using mineral powders as studying materials. Despite that the using of mineral powder is widely accepted in many case studies, such as the dissolution and precipitation of silicate and carbonate minerals, such methods based on mineral powder still have certain deficiencies for the investigation of mineral surface reactivity. Surfaces with high energy, which can enhance their surface reactivity, will be produced during sample preparation by crushing or grinding. Thus, the obtained experimental results may lead to an overestimation of geochemical reaction in comparison to real situations. 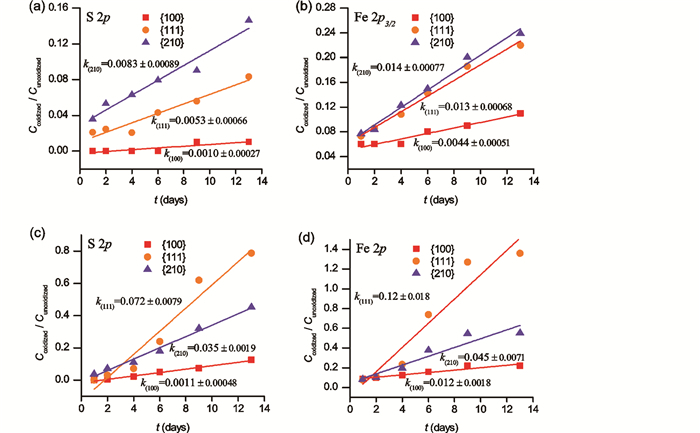 Based on the perspective of structure dependent surface reactivity, this study makes up the lack for understanding the rate and mechanism of pyrite oxidation and provides new insights into the oxidation mechanism. Our study demonstrates that the wide range of pyrite oxidation rates reported in literatures is resulted from the prominent surface reactivity differences among different crystal faces. In these reaction systems, water molecules act as both reactant and catalyst for electron transfer in the oxidation process and also is the core substance in the reactions. 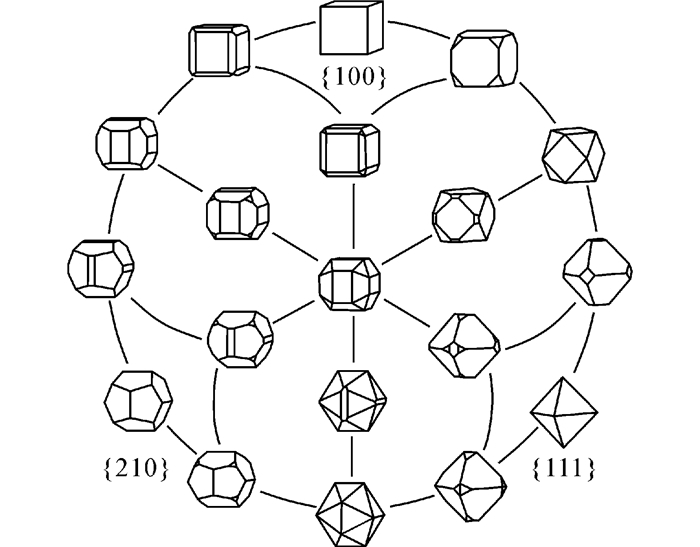 These understandings have clarified the importance of the surface reactivity differences among different crystal faces. The present study suggests that, to reveal the real geochemical processes, we should focus on the reactivity of certain crystal faces with high accuracy rather than of traditionally concerned powder surfaces. Such approaches, based on the perspective of crystal face reactivity, could provide fundamental knowledge for constructing accurate geochemical models. Cai YJ. 1990. Experimental study of crystal forms of pyrite. Bull. Nanjing Inst. Geol. M. R., Chinese Acad. Geol. Sci., 11(2): 33-45. Chen GY, Sun DS, Zhang L, Zang WS, Wang J and Lu AH. 1987. Morphogenesis of pyrite. Geoscience, 1(1): 60-76. Guevremont JM, Elseinow AR, Strongin DR, Bebie J and Schoonen MAA. 1998. 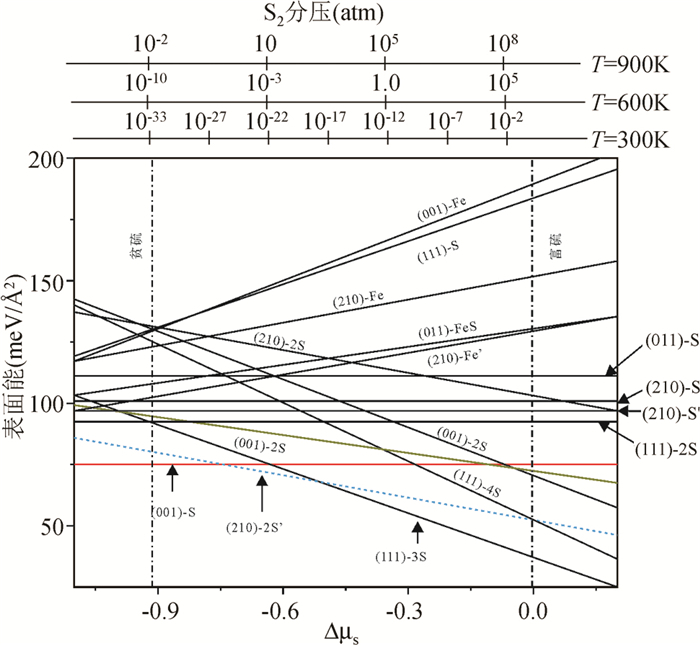 Structure sensitivity of pyrite oxidation:Comparison of the (100) and (111) planes. American Mineralogist, 83(11-12): 1353-1356. Hammack RW and Watzlaf GR. 1990. The effect of oxygen on pyrite oxidation. In: Proceedings of 1990 Mining and Reclamation Conference and Exhibition. Charleston:West Virginia University: 257-264. Morth AH and Smith EE. 1966. Kinetics of the sulfide-to-sulfate reaction. Am. Chem. Soc. Div. Fuel Chem., 10: 83-92. Nordstrom DK and Southam G. 1997. Geomicrobiology of sulfide mineral oxidation. Reviews in Mineralogy, 35: 381-390. Rosso KM. 2001. Structure and reactivity of semiconducting mineral surfaces:Convergence of molecular modeling and experiment. Reviews in Mineralogy and Geochemistry, 42(1): 199-271. Sunagawa I. 1957. Variation in crystal habit of pyrite. Report of Geological Survey of Japan, 175: 1-47. Zhao ZH, Zhang P, Chen YH, Yao Y, Wu YJ, Geng XH and Deng XZ. 2010. Study on oxidation of pyrite by in situ absorption spectroscopy. Spectroscopy and Spectral Analysis, 30(12): 3375-3378. 蔡元吉. 1990. 黄铁矿晶体形态模拟实验研究. 中国地质科学院南京地质矿产研究所所刊, 11(2): 33-45. 陈光远, 孙岱生, 张立, 臧维生, 王健, 鲁安怀. 1987. 黄铁矿成因形态学. 现代地质, 1(1): 60-76.